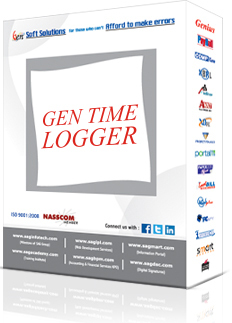 Gen Time Logger is a desktop based attendance software, which works together with the Biometric Time Attendance System. It is an innovative attendance management tool for the organizations, which dealing great with the issues of attendance like how to manage employee attendance, employee leaves, shift timings, etc. Using our SAG Time Logger attendance software, you can effectively manage each of these things at your location. This software is compatible for every type of machines such as retina scanner, fingerprint scanner, voice recognition, etc. Each machine has a unique code. It allows you to register the information of the employee. Employee auto shift configuration - It automatically configures the shift of the employee. Weekly off - It manages the weekly off by employee wise and shift wise. This section allows you to manage the shifts and week-offs of the employees. It uses to track the login and logout time of employees. And, the other given options are absent, present, late come, late gone, earlier come and earlier gone. It allows you to track the employee's break log live summary. It allows you to post the attendance to the payroll and online payroll. It provides the attendance summary employee wise and month wise. This field contains total days, off days, present days, half days, total leave days, total working, total break time, total brakes, actual working over time, late come, early gone, early come and late gone. Export all employee attendance reports in excel sheet, PDF file and doc file. Employee and month wise detail report. Date wise device log report. Employee wise late or early come report. The Employee Shift Planner decides the shift of the employee like day shift and night shift. And, you can adjust the shift planner for the employee, according to your need. It allows you to remark the employee attendance as per the adjusted time slot. For example, if the employee punching in between 10.00 am to 10.15 am then it should be considered as pardon delay, but if the time exceeds then it should be considered as a half day. The holiday master manages all the national holidays. This software generates the report of the employee on the excel sheet. And, you also can manage the reports on the basis of shift wise and department wise. Time Logger provides a data to enable comprehensive reporting and analysis. You can directly download attendance data from the machine at any time. Time Logger reporting and analytics enable companies to intuitively measure, analyze and optimize their workforce strategies.